As the 21st century matures, it is imperative that designers infuse our decision-making criteria with the overarching goal of repairing the long-term health of our planet and protecting the people who will inhabit it long after we are gone. MT products are most exciting when looked at through the frameworks of Cradle to Cradle Design™ and Design for the Circular Economy™ which both embrace this worldview. The simplicity of the MT products allows for transparency in material sourcing, material health, material reutilization and carbon management. Several of the largest producers of MT and CLT own and maintain sustainably managed forests which are comprised of fast-growing tree species, allowing manufacturers and forest management teams to harvest raw materials as needed and then quickly replenish the source stock. The cycle of harvest and replenishment sequesters carbon on a continual basis, demonstrating its capacity as a “durable carbon” product and making it an optimal material for embracing William McDonough + Partners’ philosophy of going beyond zero carbon and toward carbon positive. Additionally, MT buildings are assembled predominantly with mechanical fasteners. This construction method aligns perfectly with the Design for Disassembly methodology. Design for Disassembly is a design principle where material reutilization is paramount. When buildings reach the end of their use cycles, they are typically demolished and the subsequent waste — healthy or more often unhealthy — is discarded in a landfill to decompose over hundreds of years. By assembling the building using only mechanical fasteners, the high-value MT elements can be harvested from the structure and reused so that the material can return to industry for next use as part of the circular economy. For much of the last century wood (used as a structural material) was relegated to the lowest tiers of the building code (Types IV and V) due primarily to fire protection concerns. 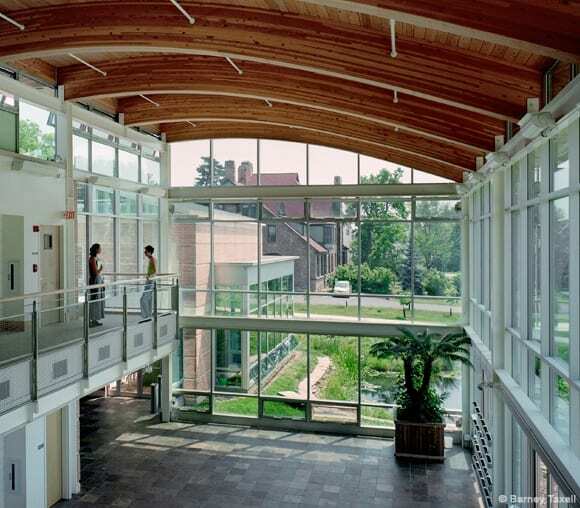 As these older heavy timber buildings aged out of their original use, they were identified as prime investment opportunities due to the exposed timber, high ceilings and large expanses of glass. The adaptive reuse of these buildings for hospitality, multi-family living, office buildings or commercial centers quickly became popular across the world. Toward the end of the 20th century, as the old timber Type IV buildings were being repurposed, MT structures began to take hold. Glu-laminated and CLT construction gained popularity as the adaptive reuse projects began to wind down due to lack of buildings to repurpose. By embracing MT developers and building owners are able to achieve the same spatial and aesthetic features of the 20th century buildings while meeting and exceeding the 21st century concerns regarding the health of our environment and the people who come in contact with buildings on a daily basis. When starting from the initial aspiration of designing a building like a tree, wood naturally becomes an important architectural element. At WM+P, wood as a building element has long been the ideal. Wood in building products is a tangible byproduct of biological systems of nature. The material would not exist without energy from the sun, water from rain, minerals from soil or carbon dioxide from the atmosphere. A tree is the sum of all its environmental elements and its beauty is a direct result from the alchemy of their combination. To design buildings like trees, we use three main principles of Cradle to Cradle Design: waste equals food, use current solar income and celebrate diversity. The HITT Co|Lab is a perfect case study for these principles. 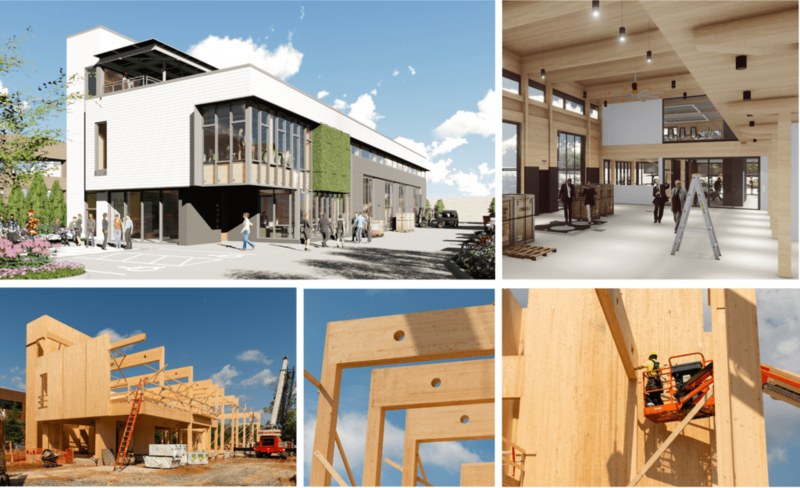 HITT Co|Lab project renderings and CLT construction progress photos. Kim Roy and Katie Rothenberg envisioned the Co|Lab as a showcase for building innovation in the 21st century that would be net-positive energy, utilize as many healthy materials as possible and exhibit smart emerging design and construction technologies at every phase of the project. With these innovation paths mapped out, MT was quickly identified as a perfect foundation for the project. At the time the project design commenced in 2015, WM+P had recently designed several residential projects of various scale using CLT. The material was beginning to emerge in commercial projects in the US as building codes began to formally prescribe design and engineering criteria to its use on commercial projects. The HITT leadership team immediately embraced the idea of using MT for the Co|Lab, given the building’s mix of raw and finished interior spaces, compressed design and construction schedule, and many sustainable and innovation aspirations. As the Co|Lab nears its estimated June completion, we are seeing increasing client interest in MT structures, including from one of the world’s largest retailers. WM+P is currently working on a 150,000 SQFT mixed-use development in Charlottesville, Virginia that will become the headquarters for Apex Clean Energy. Together, the development team and Apex identified a MT structure and net-positive office space as core building features that were mandatory for the project’s success. The biggest misconceptions or concerns with MT buildings typically center on engineering questions. Items like the fire rating of structural members, structural loading capacity and grid spacing, building acoustics and exterior envelope design. As the popularity of MT and CLT has grown over the last ten years, all these concerns and others have been addressed by the building profession. The Tall Wood Building Council was formed as a result of the building industry’s constant push for clear guidelines from the International Building Council on safety and comfort of MT buildings. The TWBC has consistently held meetings and reviewed proposals for expansion and development of MT building; however for the IBC, fire has remained the greatest concern, and rightfully so. Wood is a combustible material and new building codes are structured to address this reality. MT manufacturers have confronted fire protection head on with constant fire-rating tests to verify the expected performance of the exposed material. Over the years as new projects have pushed the boundaries of MT construction, the manufacturers have always met the challenge. Many of the same stakeholders who are involved in the TWBC were also involved in the creation of the US CLT Handbook. This document is a comprehensive source of design and engineering information for building professionals to utilize on MT projects. The use of MT and CLT is exploding right now — people are able to visit and experience the buildings that were designed and constructed by the early innovators in the field. The ability to see, feel and experience MT buildings on larger and larger scales goes a long way in validating the decision to use the material on a project. Sidewalks Labs just announced that the Sidewalk Toronto development will consist of commercial and residential buildings which will comprise 38M SQFT of MT buildings and preferred Cradle to Cradle Certified™ materials. There is also increasing interest from several of the world’s largest corporations in the use of MT for corporate campus and data center projects in addition to single and multi-family projects. WM+P is also working on a new MT development in California. No sector of the building industry will remain untouched by MT. With current building codes, the sweet spot for MT lies in low and mid-rise construction but as the new codes begin to take effect in the next few years, larger, taller and more diverse MT projects will be developed. Because of its optimization to be safe and healthy in a circular economy, it is the first truly innovative structural material to emerge in the last 100 years. Eric Ross is a registered architect and director at William McDonough + Partners with over 14 years of experience in the construction industry. Eric joined WM+P in 2013 and is currently working on two Cross-Laminated Timber structures for HITT Contracting and Apex Clean Energy, focusing on his primary areas of interest — Design for Disassembly and the emerging use of mass timber for building structures as it relates to the potential they hold for reducing a structure’s carbon footprint.